This looks like a problem with the operating system, I think that you will need to either do the conversion using your MacBook or get the problem sorted out. Sorry we can't help more. The errors in there all suggest that the problem is a security error with your system, the application sandboxing is not being allowed to select folders by the Operating System. This is not an application problem. What version of X2Pro do you have installed? Still no attachment, was there an error message when you tried to post? Nothing uploaded, did you mean to attach a file? Okay, this is what I get. 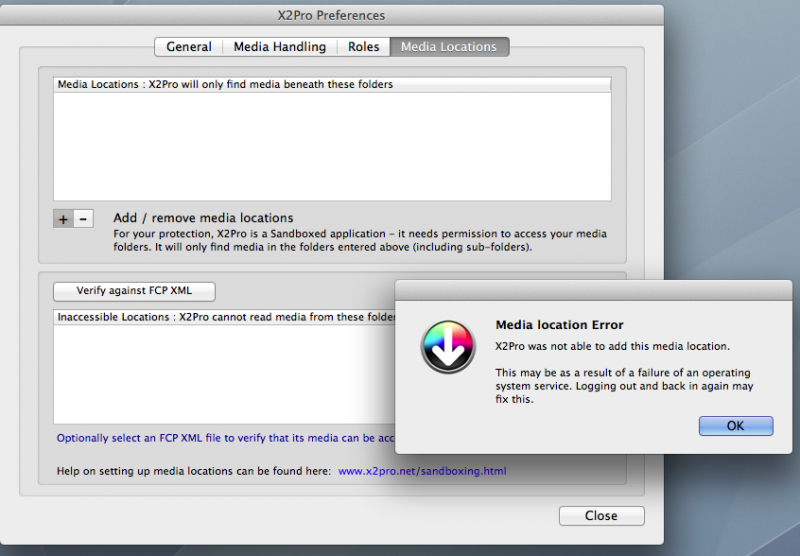 X2Pro works with all current versions of FCP-X so there should not be a problem running it on your macbook. You should upgrade to the latest X2Pro version from the App store if it is not already the latest. The System console is just that, the system console, built in to OSX, it can be found in Applications>Utilities. What is running the OSX system console, where do I do that? I tried X2PRO on my MacBook also and there is does work. Unfortunately, I can not use that because It has a newer version of FCP and they don't work together. So I have to try it from my Mac Pro. Run the OSX system console, make sure that you are viewing all messages, clear the display, run X2Pro and try to add the media location and the destination so that you see the error messages and then copy the full text output from the console (File>Save a copy as) and upload the file that it creates. What do you mean with co,sole log output? Can you upload the console log output for when you try to add a media location and a destination folder please? I'm sorry, but it doesn't work. I per mission to write to the folder. I get the same error warning when I try to add a media directory or a destination folder.